I had a thought on bedskirts. I think a lot of people see them as an afterthought, which is a shame. I'm assuming this of others, but I find that many people pick out bedding and bedroom textiles that they love and then pick a bedskirt that will play a supporting role as demurely as possible. They don't really want the bedskirt to be noticed. And, to be fair, many bedskirts are pretty heinous and can quickly render your gorgeous bedroom ugly. But, I actually prefer bedrooms where bedskirts play a leading role. I subscribe to the school of thought that bedding should be white and pretty simple, so for me, the bedskirt is the perfect place to add some color or pattern. This picture below is what got me thinking about this. I love the bedskirts in this room by Phoebe Howard. Their deeper tone and fullness draw your eye and make the room for me. If the skirts were blah and toned down, this room would be missing its magic. In our own bedroom, our bed actually doesn't work well with a traditional bedskirt, so I opted for a boxspring cover. But, the idea was the same to use the bottom portion of the bed as an opportunity for pattern. If I did something plain to cover the boxspring, I think this room would lack some pizzazz. If you like the cover, I wrote instructions on how to make your own - click here. 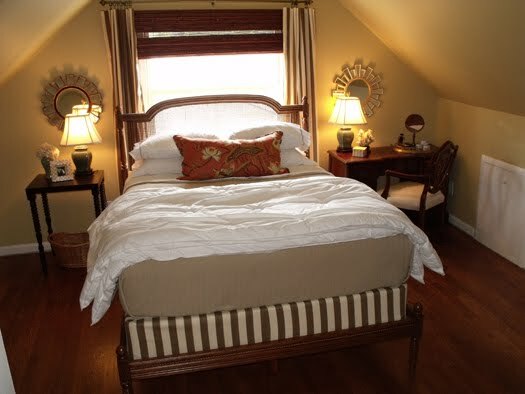 I really like the look and plan to do it again in a guest bedroom. So, if you are decorating your bedroom, think of the bedskirt as an opportunity! That's my message for the day. What are your thoughts on bedskirts? I'm definitely a fan...bedskirts really finish a bed off nicely. I recently purchased the classic ruffle bedskirt from Pinecone Hill and plan to get matching euro shams. Though white, the ruffles add some fun flair! I always show the bedskirt fabric as a major part of the design. You're right; it not only anchors the bed (focal point of the room), but provides an opportunity for emphasis and a pulled-together look. Enjoy your posts do much! I have to say, I've never looked at bedskirts this way before. Thank you for opening my eyes & mind. Now I want to switch out my boring white one.